We are so excited to announce our newest eBook, full of the best Thanksgiving recipes passed down from our grandmas, mom, and ones we’ve come up with in our own kitchens! 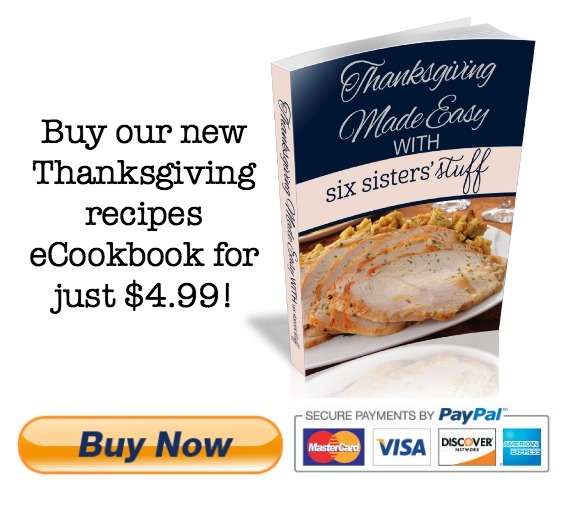 This Thanksgiving eCookbook has over 60 recipes and helpful tips to help make your Thanksgiving a complete success. An ebook is a cookbook in an electronic format. Rather than having to go to the store to purchase a cookbook, you can download it to your own computer, smart phone or tablet! You can print your eCookbook if you want a hard version or you can easily access your eCookbook from your computer or other devices whenever you are ready to cook. After you purchase your eCookbook, you will receive an email with a PDF file that you can download and save for personal use. If the book sells well, there is a chance that we will be able to actually print this book in physical form for you to purchase. Most iPhone and iPad privacy settings will not allow you to download it to your device, so we recommend downloading it to a desktop or laptop and then emailing it to yourself.